The 2018-19 season is over. Before I post an updated 2019-2020 preseason roster, let's take a look back at the performance of this past year's team. GoZags.com has a huge amount of performance metrics available at the team level, as well as the individual player level. Its all there, if you dig for it. I think it's obvious to all of us that the 2018-19 team was a different team than the 2017-18 team. In 2017-18, our offense ran through Jill Barta and Emma Stach. Without Jill and Emma in 2018-19, the team did things differently. 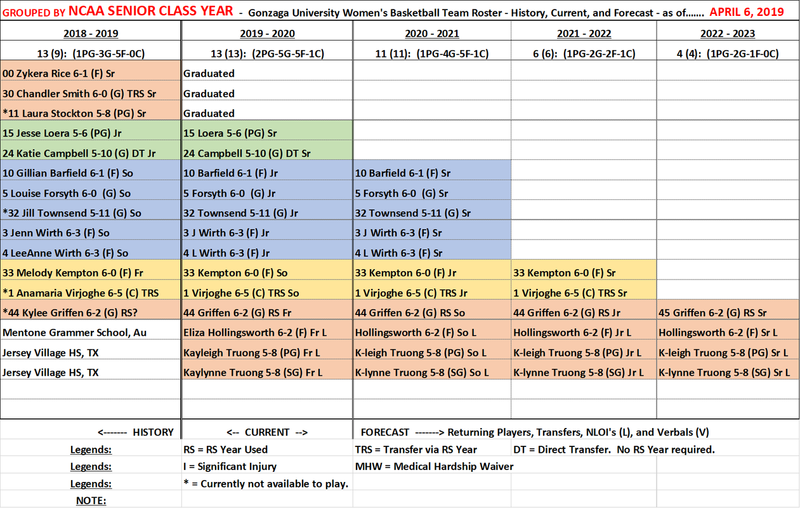 From a performance metrics perspective, to find out what was different, I took data from GoZags.com and formated it so we can easily compare 2017-18 to 2018-19. The table below compares the GU 2017-18 team to the 2018-19 team and shows the + (favorable) and - (unfavorable) changes. It also compares our opponents in 2017-18 to our opponents in 2018-19. All the blue values in the table are from GoZags.com. All the black and red values are calculated from the GoZags.com data. 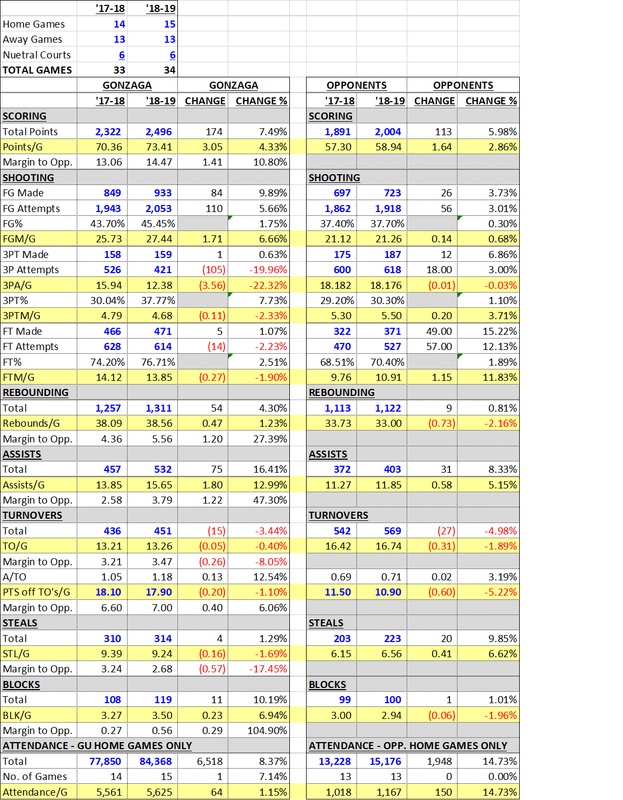 You can dig down into the details of the Metrics on your own, but here are just a few of my general observations. First of all, since the game count is different for the two years (33 games vs 34 games), you can't just look at the gross numbers. You need to look at the Metric Value per Game. I have highlighted those rows in yellow. Second. Our "Margin to Opponents" exceeded our opponents in all Metrics,.... except Steals and Turnovers. Even though we had more Steals per game and less Turnovers per game than our opponents in both years, the gap was narrowed from 2017-18 to 2018-19. Fourth. WHAT AN AMAZING YEAR!! CONGRATULATIONS TO THE 2018-19 LADY ZAGS TEAM!! So,.... here's the table. Enjoy. I drilled down to the player level in my pursuit to understand how we were able to make up for the loss of Jill Barta and Emma Stach. 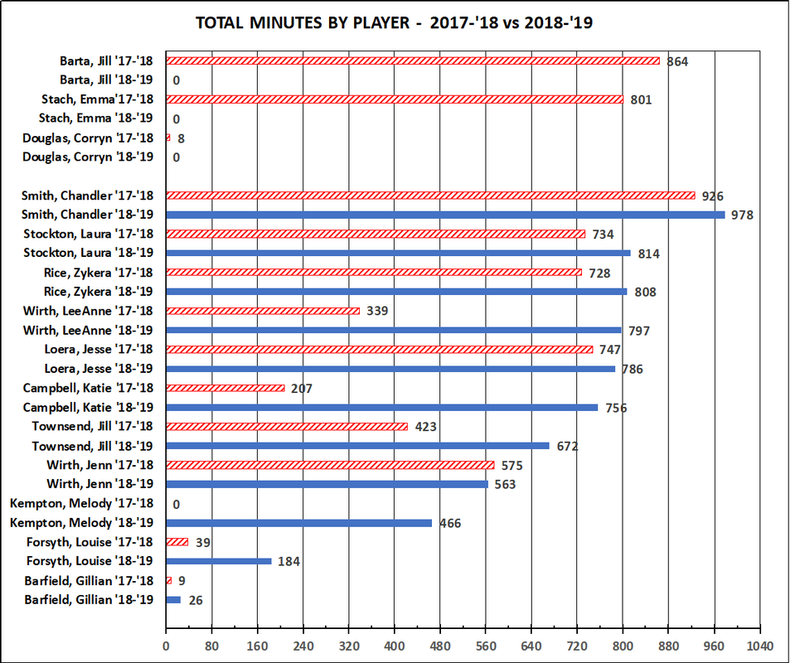 To keep things simple, I graphed minutes played in 2017-2018 compared to 2018-2019 to see where Jill's and Emma's minutes went. I also graphed 3-Points Made by Jill B and Emma S to see who made up the loss of those two players. Minutes Played: With the loss of Jill Barta and Emma Stach, a total of 1,665 minutes had to be distributed to the other players. Everyone picked up additional minutes (except for Jenn Wirth due to her broken finger early in the year). As you can see, the players that picked up significant minutes were LW (458), KC (549), JT (249), MK (466), and LF (145). 3-Points Made: Jill Barta and Emma Stach accounted for 79 3-Point shots made in 2017-2018. In the 2018-2019 season, the team scored one more 3-Point shot that the 2017-2018 team did (159 to 158). 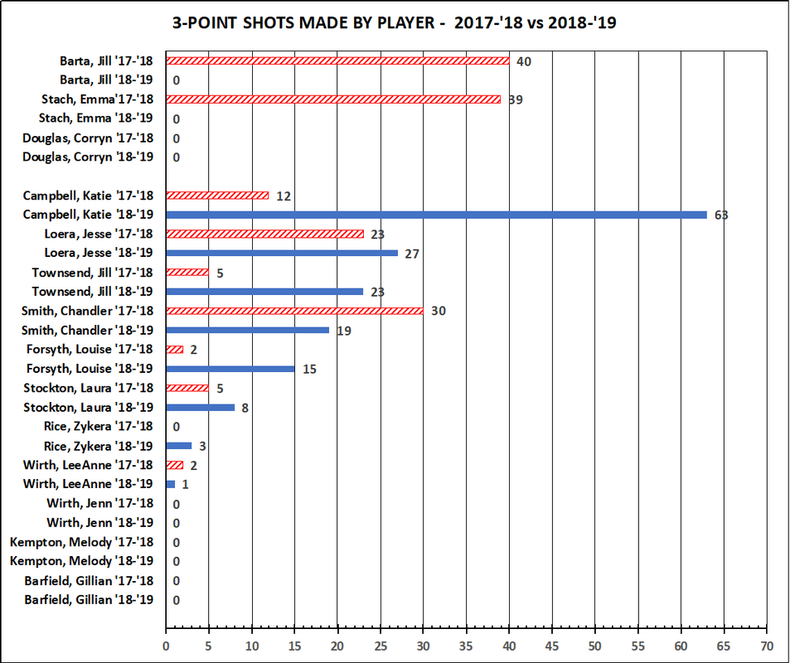 Here's a graph of the 3-Point shots made by the players compared to 2017-2018. As you can see, Katie Campbell accounted for 51 of the 79 3-Point shots that needed to be made up from the loss of JB and ES. JT contributed another 18 and LF contributed another 13. More evidence of what a truly awesome year this has been! Ok. Enough for looking in the rear view mirror. My next post will be the current status of the roster for the 2019-2020 season! I have not yet had a chance to review the data in depth yet, but I do see that you have to look closely at some of the numbers. For example, if you look at the 3 pt attempts and 3 pt apg percentages, they show huge negative values which at first glance might imply a negative connotation, but in reality it is a positive value as far as the team is concerned. Offensively, we scored more points per game than last year and shot better across the board (overall, 3 pt and free throws) than we did last year. On a per game basis, we had more rebounds, more assists and more blocks than we had last year. The only areas where we dropped off from last year were in turnovers per game, points off turnovers per game and steals per game, but the changes in these areas were essentially statistically insignificant (less than 2%). Back in October, I postulated that this team had the ability to be better offensively than last year's team and so it turned out that way. Defensively, we gave up 1.64 more points per game to our opponents. We also allowed our opponents to shoot slightly better in all aspects (overall, 3 pt & free throws) than we did the year before. The rest of the metrics for our opponents are very similar to the year before with our opponents getting slightly fewer rebounds, getting fewer blocks per game, having slightly more turnovers and slightly fewer points of turnovers than the year before but these same opponents had more assists and steals per game this year. Back in November, I predicted that this team would be better defensively than last year's team and for most of the year it was. The improvements by our opponents are essentially due to the 3 games against BYU, and our games against ND and OSU. ND & OSU I understand, but we need much better defense improvement against BYU next year. I think next year's team will have the same opportunity to improve both offensively and defensively. If they do improve on both sides of the ball, next year's team could be very scary if they put it all together. The graph below is very similar to the "Total Minutes By Player" graph in my previous post above. But there was one more game in 2018-19 than there was in 2017-18. That distorts the magnitudes of the variances between the two seasons. 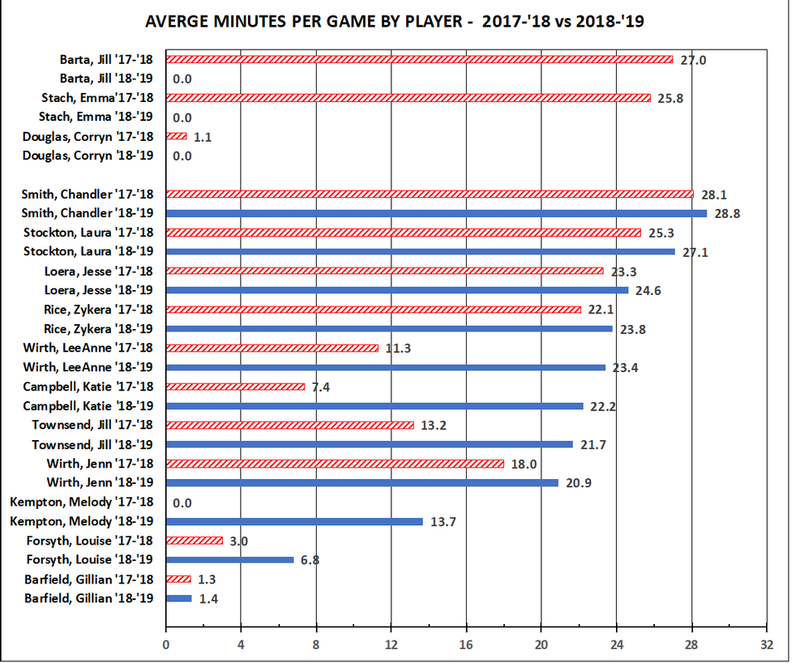 The graph below is "Average Minutes Per Game By Player", which provides a level "playing field" in comparing the two seasons. it still stuns me that Zee IIRC has only taken 3 3pointers her whole Zag career....correct me if I'm wrong......she took two at the end of the byu game and one late Oregon game....(.missed opportunities?..).. and she made all 3. If you are a 3-. 4- or 5-star rated recruit (which you need to be to play for a Top-30 D-1 team), you are used to being the "go to person on the team", playing essentially all of the minutes in the game. Everybody on the team (excluding walk-ons) feels (or should feel or they should not be there) they should be the person starting, the person getting the most minutes, being the go to person. Obviously, not everybody can be "that" person. When athletes feel their coaches are not making the best use of their talent they will look for what they think or feel is a better situation for them. Sometimes it works, sometimes it does not. Most rosters go 7-10 deep and there is only 200 minutes to spread around per game. For the Lady Zags, we had 2 players average 25-30 mpg, 6 players averaged 20-25 minutes, 1 player averaged 10-15 mpg, 1 player averaged 5-10 mpg and one player averaged less than 5 mpg. A look at the Stanford roster is pretty typical of a Top rated team. 3 players averaged around 30 mpg, 4 players average 20-25 mpg, 3 more average 10-15 mpg, 1 player averaged 5-10 mpg, and the remaining 3 players averaged less than 5 mpg. When comparing the teams, 7-8 players are averaging over 20 mpg, a couple more in the 10-15 mpg and the rest of the roster getting less than 10 mpg. This year's Lady Zag roster was one of the most unselfish, team orientated rosters I have had the pleasure to follow. Two (2) of the starters at the beginning of the year (JW and JL), got injured and missed several games, yet they apparently seemed to accept coming off the bench even after they were healed, to support the greater good of the team. The coaches have to be very careful when offering transfers, because if a person is leaving their initial school because of a lack of playing time, they may not be any happier at GU. According to the official stats, Zee attempted 4 3's this year and made 3. In 2017-2018 Zee was 0-4 from 3, 2016-2017 Zee was 0-2, and in 2015-2016 Zee did not attempt a 3-point shot. You are correct on all counts. The bar chart in Post #77 above is just a comparison of 3 Point Shots Made in 2018-19 vs 2017-18. I did not graph any data regarding the number of 3 Point Shots Attempted. Zee's fourth 3-PT shot attempt in 2018-19 was against Little Rock. 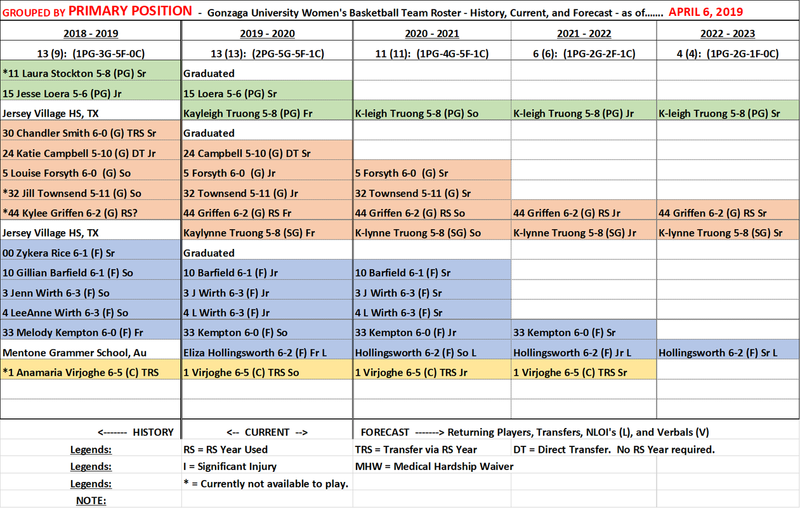 Moving on to looking forward to the 2019-20 Roster, here is the current status, as far as I know. If you spot any corrections that need to be made, please let me know. As I've done in the past, there are two tables for the Roster, both containing the same information. The first table is organized by the NCAA Senior Class year. The second table is organized by grouping players by Position.